Ordnance Survey Ireland (OSi), the national mapping agency for the Republic of Ireland, recently commissioned an economic report on Ireland's geospatial industry. 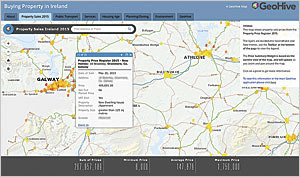 The assessment, carried out by the independent economic research organization Indecon, concluded that better use of location-based information in Ireland enables the public sector to save 82 million euros annually, frees up enough time to equal 279 million euros, and provides 104 million euros in competition benefits across the country. Inspired by these findings, OSi took the lead in making Ireland's vast geospatial data resources more widely available via the Internet using ArcGIS Online. With GeoHive, users can combine and layer different datasets on up-to-date OSi maps and easily share that information via mobile devices. The organization already had a web-based map viewer that attracted more than 1.5 million unique visitors a year. But the technology behind this web service was becoming outdated and couldn't deliver digital cartography to tablet and mobile devices. So OSi launched an ambitious project to replace its existing map viewer with a new online portal that would improve the user experience, as well as make third-party, public-sector data easily accessible from a single location. OSi worked closely with Esri Ireland to use the ArcGIS platform to completely redevelop and modernize its online mapping capabilities. Named GeoHive, the new, free-to-use web service contains significantly enhanced end-user capabilities, including the new Make Your Map tool. "For the first time, users can access current and historical OSi maps on their mobile phones and tablets whenever they need them," explained Hugh Mangan, general manager of business and marketing for OSi. "GeoHive also gives users the ability to create maps in a much simpler way, save them, and share them instantly with colleagues using any device." Most importantly, GeoHive combines OSi mapping with data from a wide range of public sector partners to create an authoritative national spatial data infrastructure. "GeoHive is a classic portal in that it provides an access point to lots of existing sets of spatial data that have already been published," said Mangan. "However, it is unique in Ireland in the way that it combines over 142 layers of third-party data from 35 public sector bodies and presents them seamlessly to the end user from a single site." 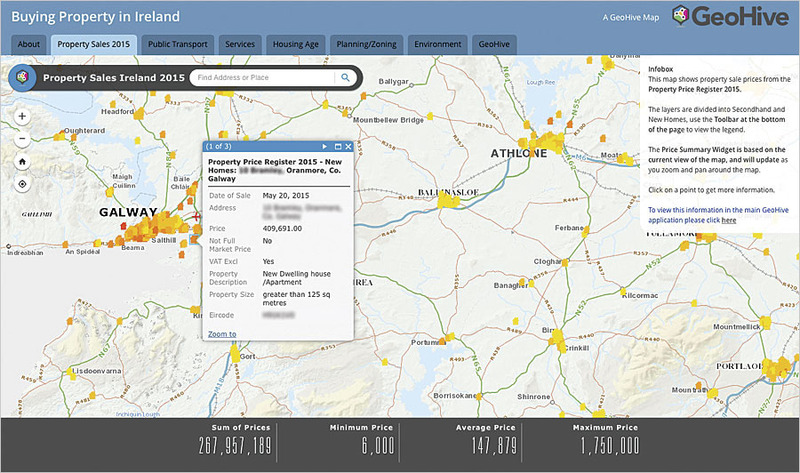 Launched in November 2015 by Ireland's minister for communications, energy, and natural resources, GeoHive improves access to national geospatial information and exposes many more individuals and organizations to Ireland's vast reservoirs of geospatial data. From a single website, users can combine and layer different datasets against the background of up-to-date OSi maps to discover fresh insights into various situations and easily share that information via mobile devices. This capability is expected to encourage new investments in Ireland that support the recovery of the country's economy. OSi's story map for potential home buyers displays key property considerations—such as proximity to schools, transportation, and hospitals—to help people make informed decisions. As part of the GeoHive development project, OSi has used ArcGIS Online and Esri Story Map templates to publish ready-to-use maps that are specifically designed to help people make evidence-based investment decisions. For example, OSi created an industry story map that displays information about the working population, skills, infrastructure, and transportation in key locations across Ireland. "If a business owner is considering opening a new office or factory in Galway, GeoHive presents all the information that they need to help them understand the area and make informed decisions," explained Mangan. With such detailed information open and available, organizations will be able to access the significant cost-saving opportunities OSi identified in its economic assessment of Ireland's geospatial industry. "ArcGIS has enabled OSi to deliver a service that has the potential to really boost the value of geospatial data to the Irish economy," said OSi chief executive Colin Bray. "By making location-based data more accessible, usable, and meaningful for everyone, GeoHive will help public and private sector organizations to reduce costs, save time, and capitalize on new business opportunities." GeoHive also benefits individual citizens, who can now find public information more easily. For instance, OSi has built a story map geared toward people buying residential properties. It displays key considerations, such as nearby schools, transportation, employment, hospitals, and crime. With this information at hand, potential homeowners can use simple tools to make informed choices that will enrich their lives. "We've taken all of the hard work out of finding information by presenting everything that people might want to know in one place [that has] a logical interface," said Mangan. By making data more accessible to a wider audience, GeoHive has helped OSi and all participating public sector organizations improve their customer service. As Mangan observed, "GeoHive provides a window to a wider world." OSi has been driving geospatial and geographic innovation in Ireland since the early 1800s, and GeoHive is just one of a wide range of new and ongoing initiatives that the organization is spearheading to provide improved products and services to customers in Ireland. Another recent project is the multiresolution data store, which OSi is using to deliver a new set of small-, medium-, and large-scale cartography, paper products, and digital web services—all derived automatically from OSi core data holdings—for distribution through multiple channels. It is through this tradition of innovation, and with solutions like GeoHive, that OSi is gradually unlocking the full potential of geospatial data in Ireland and making location-based information readily available to support the recovery of the Irish economy. For more information, contact Michael Byrne from Esri Ireland or Hugh Mangan from Ordnance Survey Ireland.